Our Polar theme week was shortened quite a bit because of snow creating snow days and delays. We still managed to fit in a few fun polar theme centers and activities, beginning with our Question of the Day. One of the questions asks students if they are taller than an Emperor penguin, so I had one displayed in my room so they could figure it out after taking a guess. The life size penguins are from way back when I used to teach middle school and did a penguin research unit. The final project was the life size penguin, which I now pull out each year to share with my preschool students. Easel activities included a penguin number order puzzle is one of several in 3Dinosaurs’ penguin pack. I laminated and added magnets to the back to use on the easel. I find that students are more likely to do these puzzles on the easel than sitting in a bin on a table. The magnets also help the puzzle pieces stay still while students are attempting to put it together. On the dry erase side of the easel I put up a step by step for drawing a penguin. I am unsure where this particular one came from, but found a few similar ones here and here. During January we do an assessment of several skills of our PreK students, with patterning being one of them. I used these Penguins on Ice (affiliate link) to assess three different types of patterns with my students. Even students who never want to leave the block area were happy to come play with the penguins with me. There are plenty of penguins and ice bars to have several students at this center at a time. I set it up for two students, but occasionally ended up with three with no problems. If I had gotten out all of the ice bars I could have definitely had four spots to play. Most activities and centers in my classroom work on fine motor skills alongside literacy and math skills. Above you can see a counting activity with polar animals from my math center that I found here. Students needed to match the clothespins with the clipart of the animal before clipping it onto the cards. Since my students this year enjoy Q-tip activities I pulled out my new Polar Q-tip Painting set, which is also part of my Arctic Math and Literacy Bundle. Students use a qtip or cotton swab to paint the dots and can use the qtip or another writing utensil to trace the polar animal’s name. We played some Pop’n Drop Penguins this week. I simplified the game rules for students since I did not have a student this year who already knew how to play. They enjoyed popping the die in the middle, while I enjoyed the die not bounding around the room. I also had out an Arctic TOOB set, similar to this one. It appears that mine has some extra pieces in comparison. I used the printable cards from Montessori Soul to go along with my set. Since we had a good amount of snow outside that shortened our week I was able to put real snow in our sensory bin with our Penguin TOOB. I also found some penguin cards at Montessori Soul that I stuck to the lid of the sensory bin so that students could match with the figures. I added two different activities to my writing center. The first one utilizes my alphabet stamps for practice stamping and writing polar animal names. 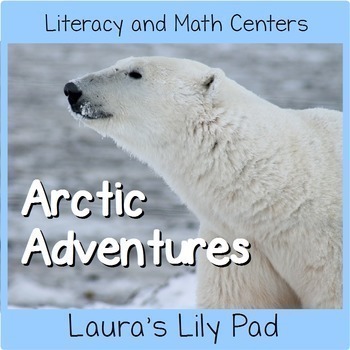 This is also part of my Arctic Math and Literacy Bundle, or can be found separately here. Most of my stamping activities earlier in the year are for the beginning letter, but by this time in the year there are several students ready to stamp whole words and write them. The other writing center activity involved coloring by code. Since my students do not know the words for the colors I colored over the words with the correct color on each sheet. We also had an older student visiting who colored the samples for the center to help students understand to color the entire area, not just the individual number to complete the activity. You can find these sheets here and here. In addition to the real snow in the sensory bin, I created some snow with baking soda and white hair conditioner. Students drew the alphabet letter in the snow. Since we had not used our poke pins in a while I pulled out this penguin poke pin sheet. Since it was a short week there were not too many students who finished this one. The Polar q tip sheets could also be used with poke pins to make an activity that is shorter in duration for students whose hands get tired with this penguin. I use the large pins below along with a couple cork board squares under the paper for this activity. Since I still had my Penguin Hunt dramatic play up from the previous week, I added some ice fishing to it. My director had created the ice fishing with the same thick blue plastic that I had utilized earlier in the year to make my bulletin board look like an aquarium. She added magnets to some plastic fish. The fishing poles we had are from Lakeshore, but the set below already is set up with fish and looks great as well. You can sneak a peek at some of my polar theme crafts on my Instagram page. If you are planning your Polar Animal or Penguin theme in your classroom, be sure to check out the activities I have in my shop below by clicking on the images. Since I did not have time for them all I will be sharing some of them with my early care students next week. 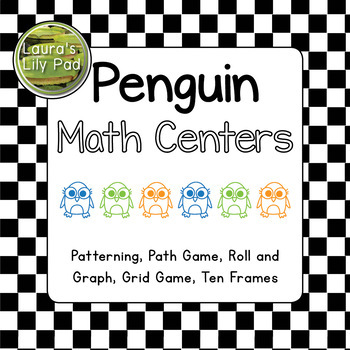 I created the Penguin Math Centers to go along with a cute set of penguin erasers I picked up on clearance at Oriental Trading. I will share some of the activities in action soon.